The Alhambra area rises up on the al-Sabika Hill and is set against the backdrop of the Sierra Nevada mountains. With lovely views over the Albiacín, city centre and the plains beyond, it is crowned by the city's most emblematic monument - the Alhambra. 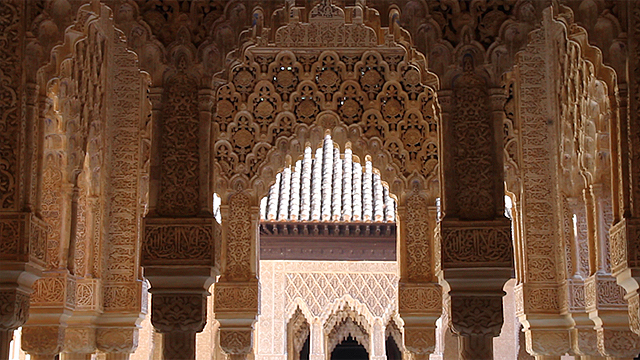 The Moorish citadel and palace, marvel of Andalusia’s Islamic heritage, attracts around 3 million visitors a year. Cuesta Gomérez is the main pedestrian route to the palace beginning from Plaza Nueva via the Puerta de las Granadas gateway. The steep street is lined by souvernir shops, guitar-makers and artisans workshops. On the lower part of the verdant hill, below the palace and set on steep and winding streets, is a small residential area including many Casas Carmen - the traditional houses unique to Granada including gardens and orchards. Click here for all of our Alhambra apartments.